Anesthetize Drosophila in their own vial. Not only is a separate anesthetizer not needed, but FlyNap is easier and safer to use than traditional ether doses. Immobilization longevity of 50 minutes. 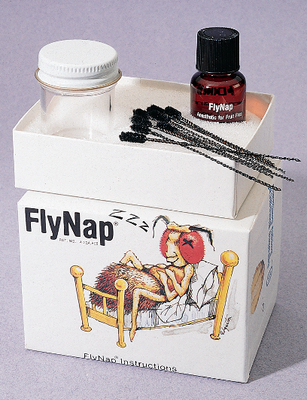 Kit includes: 10mL vial of FlyNap (100 doses), and 12 anesthetic wands. Sold only to schools.